Getting Started with Unity 5 is mostly what it bills itself as: a way to get started in Unity for beginners. 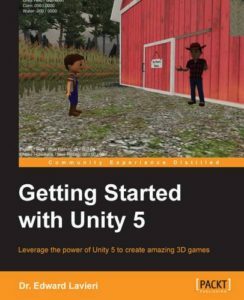 The book is clearly targeting beginners, and takes the reader from having never used Unity to making a simple farming-type game. I enjoyed reading it (in the whole 3 days it took to finish), however I’m not sure exactly how much I learned (if anything at all). At 195 pages, the book is not extremely thorough, but does cover a lot of the basic fundamentals of game development with Unity. Unfortunately, that coverage is brief and only really scratches the surface. Some of the topics featured include: downloading Unity (an easy one), the editor views like scene/game/project/etc., game design, importing assets, animation, C# scripting, UI, and sound. Looking at that list, it seems like a lot of stuff, but some chapters are barely even 20 pages long. Not that it’s bad as an introduction, it could be a good place to start, but I feel for experienced developers the book falls short. Besides the brevity of the coverage, I found some of the instructions confusing. For example, on the topic of programming, the author explains how to code different animals in a farm to do similar things like eat or have babies. This would seem like a classic text-book example for using object-oriented programming principles. Instead, the author concocts some cryptic array of numbers, where a 0 means a pig and a 1 a chicken or something or another. Not to say that this won’t work, sure, it will compile. It’s just not a great way to teach programming concepts to a beginner. I don’t especially like giving bad reviews, and I don’t want to say the book is bad. It’s titled as a “getting started” book and that’s just what it is. I’m just not sure it’s the best instruction for a beginner, and the programming sections in particular were lacking for me. There are not many Unity 5 specific books available today but, truthfully, much of what’s covered in this book would have worked the same in Unity 4. Even so, the older Unity books I’ve read were much more comprehensive and useful than this one. So if you’ve just started to learn now, this book may be worth picking up as a quick intro if you understand it’s not very deep at all. Experienced Unity developers should keep moving.